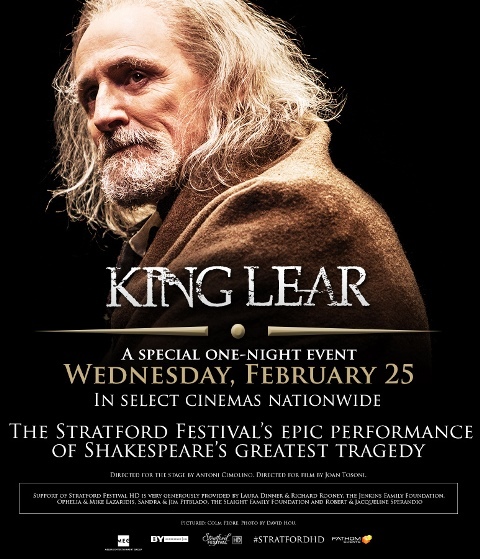 Tonight, for one night only, you have the opportunity to see Colm Feore in The Stratford Festival’s production of King Lear which will play in quite a few cinemas around the state. Click Here for a complete list. The 2 hours, 50 minute film (approximate) includes one intermission. Captured live at the legendary Stratford Festival in Canada, King Lear is the story of a kingdom divided, a family destroyed, the faithful banished and the hateful left to wreak inhuman havoc in the realm. Four hundred years after it was written, King Lear resonates as never before. This powerful and unforgettable production of Shakespeare’s greatest tragedy stars the incomparable Colm Feore in the role of a lifetime, directed by Stratford Festival Artistic Director Antoni Cimolino.